Founded in 1988, Beta Three is located in Dongguan, Guangdong, China. Beta Three has nearly 30,000 square meters of manufacturing capacity, 700 skilled workers and 71 experienced engineers, primarily engaged in R&D. Beta Three Sales Team is responsible for the promotion of Professional Audio Systems and MI products. • Beta Three is a registered and active member of China Entertainment Technology Association. • Beta Three is recognized as an advanced technology company based in Guangdong province and is known globally for its outstanding products. • Beta Three was an official supplier for three 2008 Olympic Stadium Audio Projects. Beta Three has sales offices in Beijing, Guangzhou, Shenzhen and Hong Kong focusing on professional sound engineering, system design, technical services and product sales. Beta Three provides reliable products, strong technical support, marketing, and after-sales service to domestic and international customers. Our products are suitable for many applications where quality audio is required. Beta Three products are sold in over 80 countries and the product is respected by the users. With strong engineering strength, Beta Three has completed many large-scale sound reinforcement projects, such as: 2008 Olympic Stadiums (Beijing Workers Stadium, Beijing Workers Gym, and the Beijing Capital Gym). Other major projects include: Huizhou Center Stadium; Weifang Olympic Sports Center Stadium; Jiangsu Kunshan Sports Center for the 2010 Asian Games and the 11th National Games 2009; The National Sports Center of Bahamas and many other large domestic and international projects. Beta Three is constantly developing technology and innovation making their products and services leading-edge, whilst also ensuring they are competitive and cost-effective. Over the years Beta Three has maintained it's vision of "Developing Beta Three as a globally recognized and respected brand” . Beta Three respects the talents and dedication of all our staff. Through the commitment of our managers and engineering staff we able to develop products with outstanding technical innovation, including system design, engineering applications, technical support, product customization, and other services required to support our customers. Beta Three has ISO9001:2008 certification, and operate with IEC & AES standards. 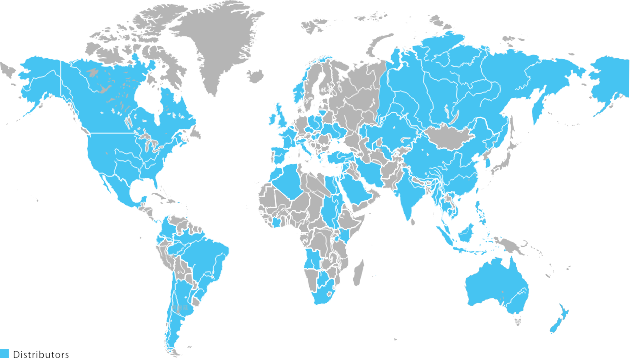 Beta Three products are currently distributed through 98 dealers in 63 countries around the globe. We are one of the leading Pro Audio export manufacturer in China, with market share over 10%. In 2012 our export turnover was $31 million (US). Over the last 5 years we have maintained a growth of not less than 17% on the export business each and every year. the second letter in the Greek alphabet system. The Greek language has more than 1000 years of history, and originated with the Phoenicians. The Phoenicians put alpha (α) in the first position, representing cattle farming, where cattle represents wealth, being important for food, clothes and farming. β ranks second, representing a house (the pattern of the character symbolizing a house with two rooms) in the old age. β ranks second, because a house ranks second in human's hierarchy of needs, just after food and clothes. At that time, one who owns cattle, food, clothes and a house can be regarded as well-off; one who owns a two room house can be regarded as noble. β is therefore also a symbol representing noblility. the third number of the Arabic numbering system, also with the meaning of ranking third. In the old western culture, 3 is considered a lucky number, representing creativity and vitality. In old Chinese culture, 3 is not a precise quantity, it means all-inclusive. contains the ancient Greek culture and the profound culture of China. The combination of noble "β"and lucky "3" together form the brand"β3". "β3" aims at number 1, showing an unremitting spirit, modest yet determined pride. It further aims to build a brand image which is charming yet modest, appealing to the market with charisma, creativity and vitality. Based on the Greek alphabet β, the symbol is in fact a clever combination of two music symbols forming a beautiful and pleasant image. '3' symbolizes a human ear, and β and 3 together symbolize an image of listening to music. The external frame represents a camera's focusing frame. The overall logo represents the capturing the moment where one is listening and enjoying music. Listen to the wonderful music, enjoy the wonderful moment.